Fall table runner Chanteclair pattern made in Provence by a family business. It is presented in a unique pattern and woven Jacquard for a very good color rendering, making it an original table runner. It is framed by a leafy and flowery frieze in soft shades of green and ocher. Its dimensions of 67x20 inches make it a large model. Machine washable, its mixed composition cotton (60%) and polyester makes it of an easy maintenance, including for ironing. It is a delightful drawing of four large hens with shimmering colors on an ecru background positioned on either side of the center. The center of the table runner is decorated with large patterns fused in the weave ecru to allow the installation of decorative objects. The whole is framed by a frieze in the same tones. The finesse of the design is highlighted by the jacquard weave that illuminates the warm tones of the patterns. The large, elegant frieze edged with a white finish gives a touch of cheerfulness and simplicity to this very country dining table cover. This table runner has specific dimensions compared to other items in the same subcategory: its length is 67in. for a width of 20in. It will fit a rectangular table out of standard dimensions. 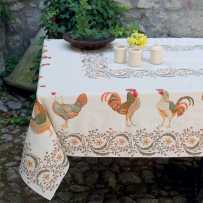 Figuring farm animals, the Chanteclair design is perfect to celebrate Thanksgiving. These delicious hens remind us farms of the ancient times when animals used to enjoy freedom and fresh green grass. There are several items to combine with the Chanteclair table runner to give a rustic touch to your interior design. We suggest you add a square table mat and cushion covers. The collection also contains shimmering placemats. You will fall in love with these items of very high quality for a charming and quaint decoration. These little Provencal chickens will nest in your living room with simplicity, without ever getting tired.